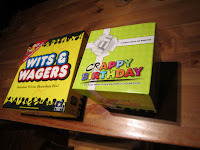 One-sentence review: "Well, that was a helluva lot funnier than I expected..."
The full-length review: One of my favourite party games is a lovely little trivia game called Wits & Wagers which manages to make random trivia fun by allowing a player to gamble and win without necessarily knowing the answers. 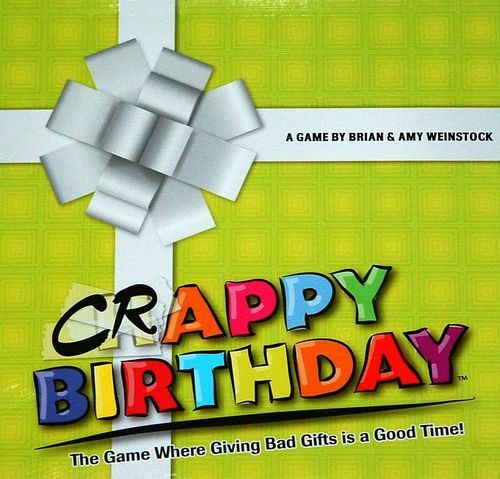 When North Star Games offered copies of their newest game, Crappy Birthday, I took a look at the rules and thought, "yeah, this one's not for me." It beared a striking resemblance to Apples to Apples, another great party game that can sometimes end up remarkably boring when played with the wrong group of people. But Luke of North Star described it to me as more of an "icebreaker" than most games and if taken lightly enough, it can be really funny (he must follow my blog and knew to warn me). So with that in mind, we dove into this game over the past weekend with a group of friends of mine who didn't really know each other that well. The rules are extraordinarily simple. 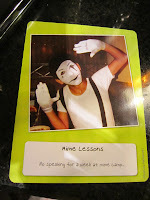 (In fact one might even argue that there is barely even a game here...) Everyone has a hand of cards with images and descriptions of some really crappy gifts. Each player takes a turn as the 'gift receiver' and gets a card face down from every other player. The cards are mixed up and then revealed and the gift receiver picks the gift they think would be the worstest, awfulest, baddest present to ever, ever get. The player who gave that gift gets a point, everyone draws a card, and the next player gets a turn getting a bunch of junk. First player to give three of the stankiest gifts wins. Pretty simple. And I have to admit we had a rather awesome time playing it! 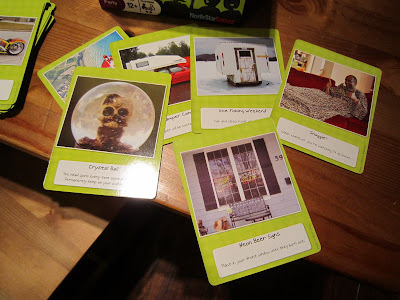 We discussed the reasons people wouldn't want things and we laughed at the hilarious photos on some of the cards. As an icebreaker, it fit the bill perfectly and made for an excellent way to start the night out. Now a caveat: this game is VERY casual. If I hadn't been warned beforehand that it was more of an icebreaker, I might have found it a bit bland. But if you go in with the right attitude and some witty friends, I gotta tell you it makes for quite an entertaining half-hour. Kudos to North Star for finding yet another great way to bring people together. Highly recommended. The giveaway: When North Star had first offered a review copy, I mentioned perhaps a giveaway to celebrate my 300th blog post and they were all for it. Unfortunately, due to them being busy and me also being just busy that post came and went. (This particular post is #318, methinks.) HOWEVER, today may just happen to be my birthday and I tend to be rather miserable for most of my birthdays. 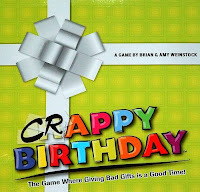 So what better reason to do a giveaway of their game, Crappy Birthday, then to celebrate my own crappy birthday. If you're interested in a copy, shoot me an email at domcontests@hotmail.com with your name and a description of the crappiest gift you ever received and I'll do a draw on Nov. 10th for a brand new copy of the game! I'll probably post some of your crappy gifts, too, if I get some real winners! Got a 3-player game of ATGOL in last Friday and I must admit I enjoyed it more than I expected. If you haven't heard of it, it's Uwe Rosenberg's third 'BIG' game following the footsteps of the brilliant agony of Agricola and the resource/engine-building of Le Havre. Agricola may be the pinnacle of game design and I thoroughly enjoy it so I'll try any Rosenberg game once. Le Havre is a great design, too, but just way too long for my tastes. Now, the player interaction in those two games is subtle but definitely there. 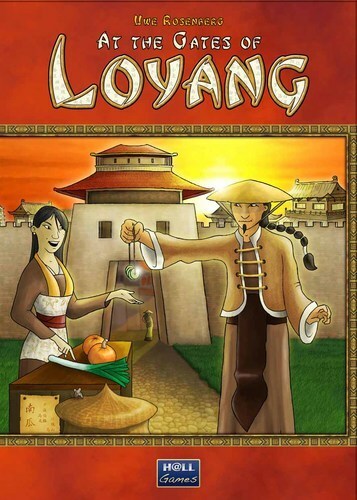 Loyang on the other hand has been described by many as a multi-player solitaire/puzzle game where each player has to wait while the others take their rather long turns. Happily, this wasn't my experience although I can definitely see the possibility of it happening. It was a churning, thoughtful game with lots of pretty bits. I would definitely play it again. Also finally got a play in of Lost Cities: the Board Game. I've played the original excellent 2-player card game an uncountable number of times now and the board version was exactly what I expected. Except even more chaotic with 4 people. Still thoroughly enjoyable. 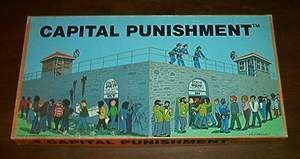 And board games promoting virtue all but disappeared. Being calculating and ruthless was now the way to reach a game’s end goal—be that money, property, or a big promotion to the office on the corner. "It takes you from conception all the way through 40 long weeks of pregnancy, and the first person to dilate to 10 centimeters wins the game." ...and it even has appearances by the other Eric Martin. Ha. I love documentaries. And I love board games. I may actually have to check this one out. My first foray into board gaming conventions this year, Origins 2011, was a moderate success I'd say. I didn't know anyone (besides my partner) so I didn't spend too much time actually gaming. But I made some great purchases and saw some interesting previews of upcoming titles. 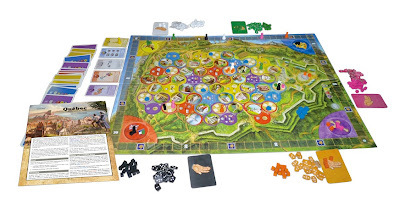 One of the highlights was having the game Quebec from Montreal's Le Scorpion Masque explained to me by one of the designers Philippe Beaudoin. Only a prototype was available at the time but he was able to give me a decent overview of play and describe the fascinating scoring mechanic. In short, Quebec is a strategy game about helping to build Quebec city over a few centuries by contributing workers to the various different buildings that players choose to build. The players need to work together to complete these buildings for points but at the same time they are also competing directly for majorities in the 5 spheres of influence. What looks really fun is that during scoring a player with a majority can cascade half their pieces to the next sphere of influence causing perhaps a ripple effect of points for someone who plays things right. It looks to be quite a deep but dynamic experience without too much chaos. 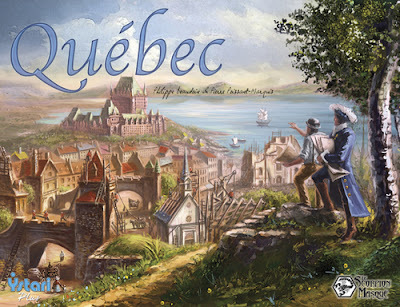 The ruleset is actually simpler than I expected and offers 3 levels of play to ease players into the full game with the historically accurate events which really bring Quebec City to life. It doesn't hurt that the graphics are gorgeous, too. Who am I kidding? I can't resist a well-designed board game that presents a big old well-researched slice of Canadiana. Looking forward to it.